Beijing: India may have missiles that can reach most parts of China but stands "no chance in an overall arms race" with the country, a Chinese daily said Thursday, when India test-fired its 5,000 km range nuclear capable missile, and added that New Delhi would gain nothing by stirring "further hostility". The article, "India being swept up by missile delusion", that appeared in the op-ed section of the state-run Global Times said India apparently is hoping to enter the global intercontinental missile club, despite intercontinental missiles normally having a range of over 8,000 km. 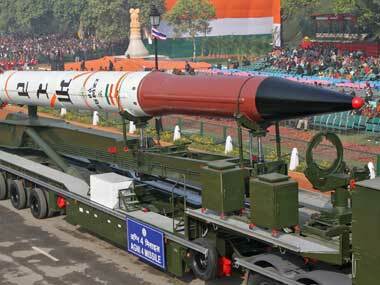 India Thursday test-fired the Agni-V missile that can accurately hit targets more than 5,000 km away. With this launch, India entered an exclusive club of nations that have this capability. The daily noted that India has moved rapidly in developing missile technology. "It successfully launched the Agni IV with a range of 3,500 km last year. Indian public opinion has long seen China as its reference point for military development," it said. Criticising India, it said the country "is still poor and lags behind in infrastructure construction, but its society is highly supportive of developing nuclear power and the West chooses to overlook India's disregard of nuclear and missile control treaties". "The West remains silent on the fact that India's military spending increased by 17 percent in 2012 and the country has again become the largest weapons importer in the world," it said. It stressed that India "should not overestimate its strength". "Even if it has missiles that could reach most parts of China, that does not mean it will gain anything from being arrogant during disputes with China. India should be clear that China's nuclear power is stronger and more reliable. For the foreseeable future, India would stand no chance in an overall arms race with China," it warned. It went on to say that "India should also not overstate the value of its Western allies and the profits it could gain from participating in a containment of China. If it equates long range strategic missiles with deterrence of China, and stirs up further hostility, it could be sorely mistaken". The daily advised that China and India should develop as friendly a relationship as possible. "Even if this cannot be achieved, the two should at least tolerate each other and learn to coexist." It quickly added that it would be "unwise for China and India to seek a balance of power by developing missiles". "The geopolitics of Asia will become more dependent on the nature of Sino-Indian relations. The peace and stability of the region are crucial to both countries. China and India should both take responsibility for maintaining this peace and stability and be wary of external intervention," the article said. "China understands the Indian desire to catch up with China. China, as the most appropriate strategic target for India, is willing to take India as a peaceful competitor." The daily said China and India are sensitive towards each other, "but objectively speaking, China does not spend much time guarding against India, while India focuses a lot of attention on China". "China hopes India will remain calm, as this would be beneficial to both giants."